Retailers who rely on Adobe Analytics to measure marketing performance can now view that data in the Sidecar Dashboard with this update. 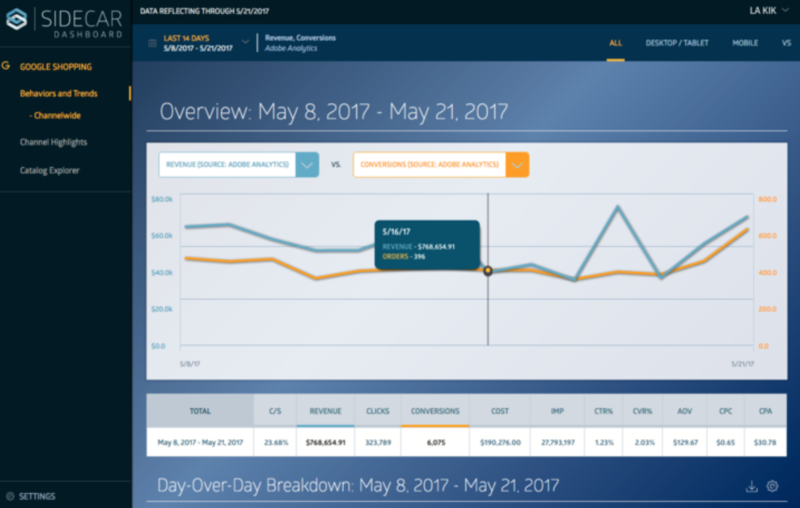 PHILADELPHIA – Sidecar is excited to announce its latest product update: The Sidecar Dashboard, a reporting platform for Sidecar customers, now includes insights from Adobe Analytics (formerly Omniture). With this data available in the Dashboard, Sidecar can provide the reporting that’s most meaningful to customers who look to Adobe Analytics for measuring performance in Google Shopping and across their global marketing strategies. Adobe Analytics is the leading attribution analytics provider for e-commerce and retail, and customers have commonly requested its addition in the Dashboard. 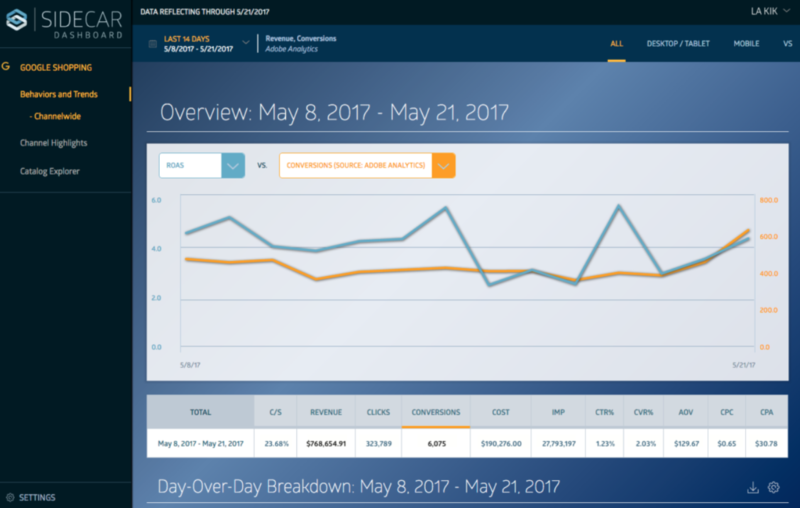 As for the user experience in the Dashboard, it still offers a clean, at-a-glance view of campaign performance. Simplicity remains paramount as Sidecar continues to enhance the Dashboard’s interface and functionality. Customers can now choose to refer to Adobe Analytics or Google AdWords within the Dashboard to view performance and attribution models easily in one intuitive interface. Sidecar will continue to expand its use of third-party data to meet retailers’ evolving needs. For the Sidecar team, the promise of data goes beyond meaningful reporting. With Adobe Analytics and other data integrations in the works, Sidecar plans to use these additional datasets to further enhance our technology. The Sidecar Product Index is the collection of datasets that our machine learning algorithms use to understand the product performance and search behavior trends impacting a customer’s shopping campaigns. By adding more rich, relevant, and accurate data to the Sidecar Product Index, our algorithms can continue to become better trained to retailers’ individual businesses. As Sidecar’s algorithms get smarter, they make increasingly accurate bid and campaign adjustments. This is how Sidecar will continue to evolve as a technology and as a partner. Look for more updates on the Sidecar Dashboard and Product Index in the near future.